Fresh off the entire Samsung Galaxy S10 range having its prices revealed a month before its official Unpacked event unveiling comes the news that the new flagship may come packing a second screen. We're not talking a second screen in the style of the folding Samsung Galaxy X, which has one screen on the outside and a folding one on the inside. No, this is a completely out-of-left-field feature that no-one saw coming. In this case, what we're looking at is a tiny layered screen that sits over the phone's front-facing pinhole camera lens. In its default state, this second screen is transparent so that selfies and videos can be taken as normal, but then it can also display icons, shapes, colours or even simply more of the main screen, thereby hiding the pinhole. Some of the layered second display's envisioned capabilities. Will the Samsung Galaxy S10 boast this functionality? As can be seen in the above image, the layered second screen would allow the area of screen on or around the phone's pin-hole camera lens to display a variety of things ranging from icons and emojis, through colours and patterns, and onto simply a "full screen smartphone with in-display optical sensors", a feat that would allow the camera lens and sensors to be hidden completely. And, while T3 likes an emoji or two (❤️) and the idea of certain systems states and functions being communicated visually, it is the idea that we can totally hide the pin-hole camera and sensor array while, say, watching the latest blockbuster movie or playing the hottest AAA mobile game that really excites us about this patent. By removing all screen-breaking distractions, the media you are consuming would be much more immersive. When the Samsung Galaxy S10 launches on February 20, 2019, can we expect to see this advanced second screen tech? Obviously, as this information has come from a patent, there is no knowing whether it will feature in the Samsung Galaxy S10 or, indeed, ever see the light of day at all. 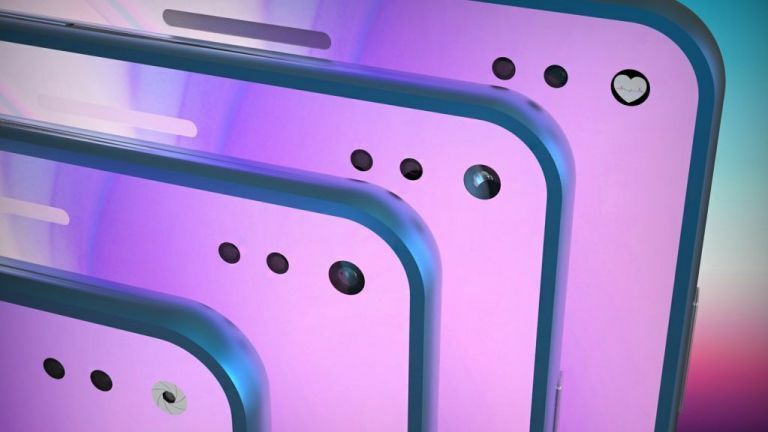 However, considering that all leaks point toward at least some models of Samsung Galaxy S10 featuring a pin-hole front camera, and the industry seemingly shifting in general in that direction in terms of design, it makes perfect sense to us here at T3 that Samsung is exploring ways to hide it as well as any front-facing sensors. We think we can all agree that the ideal design of a smartphone entails the ability to hold a device that is nothing but a screen, as in terms of functionality and aesthetics it takes the handset to a new level, allowing you to increase screen real-estate, content immersion and device beauty. And, at least on paper, this patent allows you to do that, and do so in a far more high-tech way than a simple pop-up front camera, as employed by devices like the Oppo Find X.